At Independence LIVE KYW reporters (from left to right) Pat Loeb, Jim Melwert, Mike DeNardo, Cherri Gregg, Melony Roy, and Ian Bush, share their insights on the current topics being covered by the media. For the third consecutive year, Independence LIVE hosted KYW Newsradio for its annual Executive Briefing, an in-depth discussion on some of the hot topics and pressing issues happening now and in 2019. Independence VP of Communications Donna Farrell delivered opening remarks to an audience of local business leaders, KYW Newsradio listeners, and Independence associates. 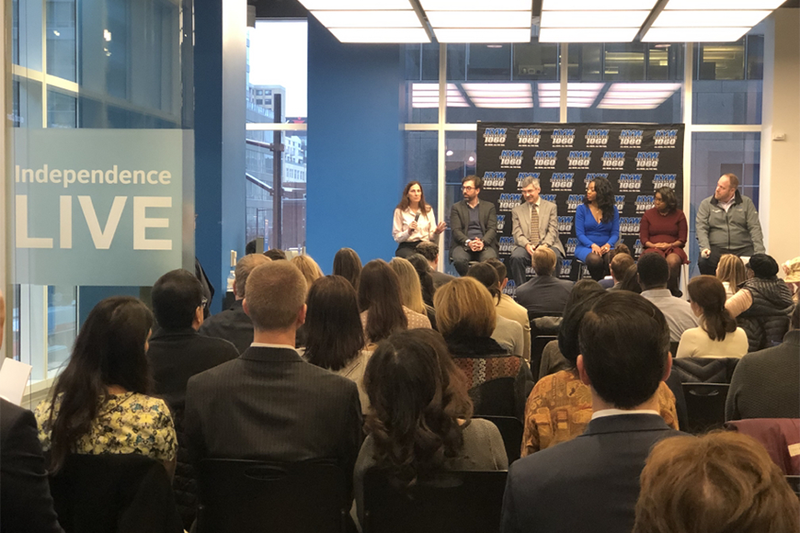 KYW’s Steve Nikazy moderated a panel of the station’s experts who shared their insights on everything including health care, education, local and national politics, as well as the latest advancements in the tech world. The full briefing is available here.